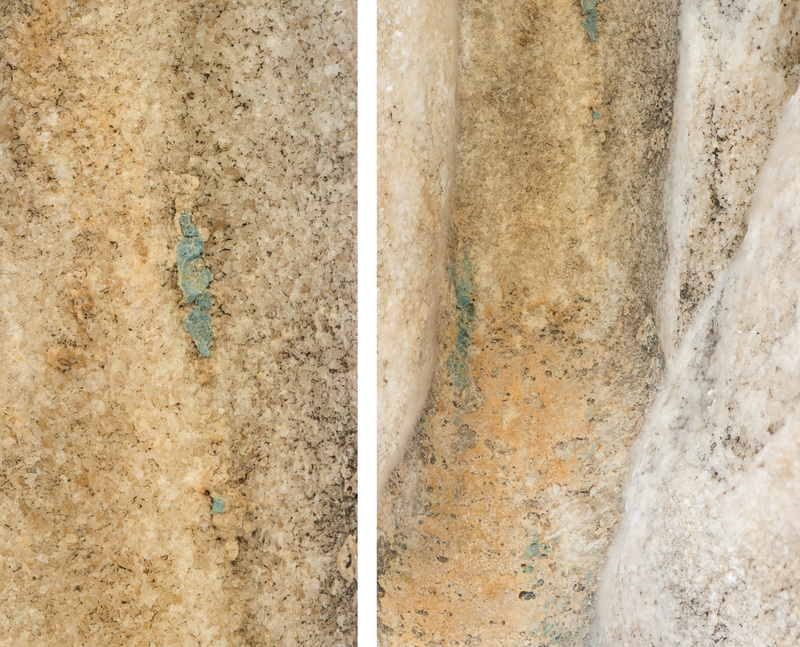 Conservator Kasia Weglowska takes a closer look at ancient colour recently discovered on the Parthenon sculptures, some of which feature in our current Rodin exhibition. Since January 2018, I have been part of a team of conservators who have had the rare and wonderful opportunity to work on the Parthenon sculptures. In preparation for the exhibition Rodin and the art of ancient Greece some of the sculptures became the subjects of an extensive scientific investigation. By using non-invasive techniques such as visible-induced infrared luminescence (VIL) and X-ray fluorescence (XRF), we were able to examine the sculptures in great detail. In the process, we discovered more about them, helping us to understand how these magnificent works of art were made. Figures K, L and M from the east pediment of the Parthenon. We began the process by moving the sculptures to the Stone, Wall Paintings and Mosaics Conservation Studio in the Museum’s World Conservation and Exhibitions Centre, where we could take a much closer look at their surfaces. 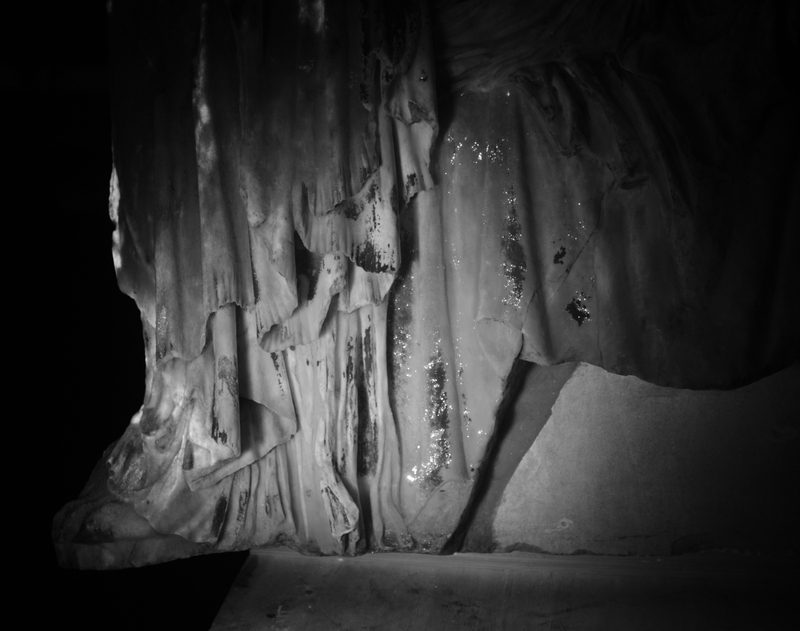 Conservator performing cleaning tests on the Parthenon metope XXXI. The first phase of conservation involved removing superficial dust and ingrained dirt. We started with a few cleaning tests to find the most efficient – but at the same time gentlest and safest – method of removing dirt, which can be visually disfiguring, but more importantly can also damage the objects. Because no two sculptures age in exactly the same way, we treated each one individually, continually evaluating our techniques and adjusting the treatment where necessary. This approach allowed us to carefully examine and document the condition of the sculptures and to gather as much information as possible about the carving techniques and the way the sculptures were painted. The discovery of original pigments on the sculptures has been the most fascinating and exciting information revealed by the cleaning process so far. The debate on polchromy (painted colours used on ancient art) on the Parthenon sculptures started many years ago, and it is now known that both the architectural elements and sculptures would have been originally painted. Even so, it was not until now that the remnants of the pigments on them could be seen with the naked eye to such an extent. 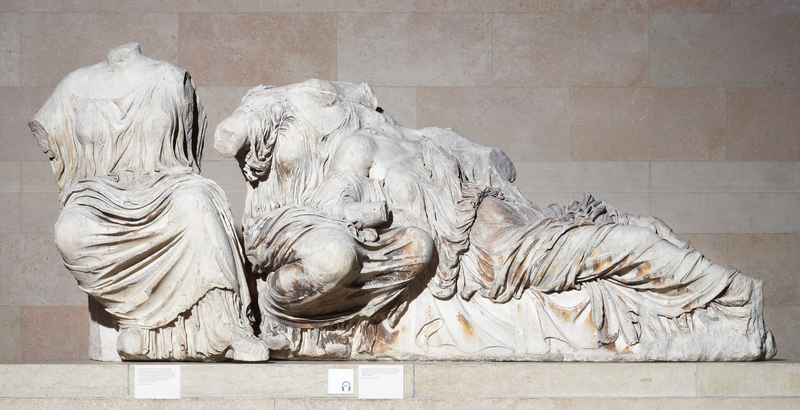 Egyptian blue visible on the figures L and M from the East pediment of the Parthenon. Egyptian blue is possibly the earliest known synthetic pigment, first used by the ancient Egyptians, and later by Greeks and other ancient cultures. Traces of this pigment have been discovered on the figures of the goddesses K, L and M from the east pediment, and figure N from the west pediment. Most of them remained surprisingly vibrant and vivid, which makes them apparent to the naked eye. These are not the only examples that survive – there are much larger areas where the pigment is visible, but only under certain light conditions. 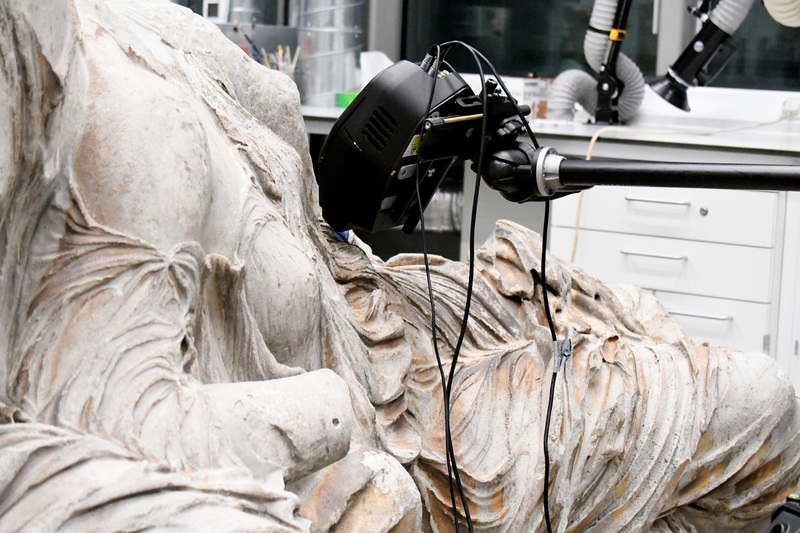 The Museum first discovered traces of paint on the Parthenon sculptures in 2009 using a technique called visible-induced infrared luminescence (VIL). VIL is a non-invasive technique developed by British Museum researcher Giovanni Verri. 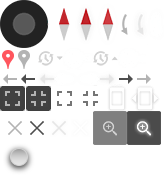 It allows detection of even the smallest remnants of Egyptian blue. The technique uses the property of the pigment to absorb visible light (mostly red light) and re-emit infrared light, which can be then captured by a specially modified camera. This emission of light is known as luminescence. Figure K from the East pediment of the Parthenon (VIL). We have employed the same technique in our recent conservation process, but the conservation studio provides a far more convenient space to look at the results. As such, we have another chance to add to this research and to learn more about the way the colour was used on the Parthenon sculptures. We were particularly delighted to find remnants of the pigment in the areas that were previously impossible to investigate, due to the way the sculptures were displayed. Figures L and M from the East pediment of the Parthenon. Left: visible light (VIS), right: visible-induced infrared luminescence (VIL). The bright white areas show the remnants of Egyptian blue. The conservation process also allowed us to take a closer look at the way the sculptures were made. Despite the weathered surface, it is still possible to see some tool marks left by the sculptors, and even identify the tools, such as the rasp or claw chisel, which were used at different stages of carving or during the finishing process. The remarkably detailed and deep drapery was made possible with drills, the marks of which are still visible inside the channels and in undercuts. 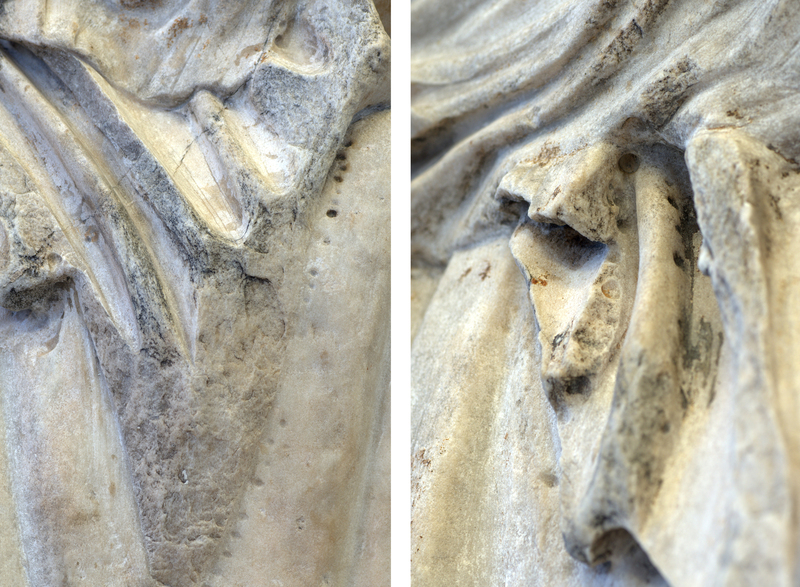 Close-up on tool marks visible on the surface of the figure K from the east pediment of the Parthenon. In the exhibition, the sculptures are placed alongside a selection of Rodin’s most famous works. Although Rodin never carved in marble himself, it is exciting to see his pieces alongside the Greek sculptures that inspired him. What would he have made of the scientific discoveries we have made? Working with such iconic objects so closely – and being able to discover remnants of pigments which have not been seen for 2,000 years – has been a wonderful and fascinating experience, and a very rare privilege. It is one example of how the Museum’s ongoing scientific research and conservation adds to our knowledge of objects, and helps preserve them for future generations. See how Rodin was inspired by antiquity in the special exhibition Rodin and the art of ancient Greece, on display from 26 April to 29 July 2018. Sponsored by Bank of America Merrill Lynch. You can find out more about the Parthenon sculptures in this blog post and discover 10 things you may not have known about Rodin. You can find out more about polychromy in the ancient world in this Tumblr post and more about Egyptian blue on the Parthenon sculptures in this video.